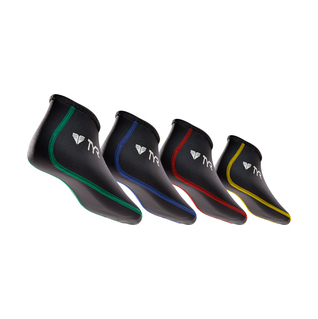 Tyr Fin Boots are engineered to prevent blisters and improve in-between swim-fin size fits. Showcasing soft, neoprene construction and flat-lock stitching. The LFS Fin Boots reduce rubbing and increase comfort. A durable, reinforced ankle is designed to last. Color-coordinated sizing allows for easy identification on the pool deck. - Please be aware that sizing is small, buying your shoe size will result in a tight fit. We recommend ordering one size up. Product swim boot was great. Nothing more to say. Product was great. The TYR Fin Boots took a little bit of an effort to get on my feet at first but when I got them on, they are really comfortable.